The kimono trend is proving to be hot again this year, and I'm here to show you how the kimono can be one of the most versatile pieces in your closet. This particular kimono is from my boutique, Nineteen Windsor Boutique, and is a one-size-fits-all option for $32. Versatile pieces like these are my favorite because you can wear them so many ways, saving room in your closet and saving money! This is one of my very favorites because of the colors. It looks amazing with jeans or white pants, giving you that many more options on how to style it. 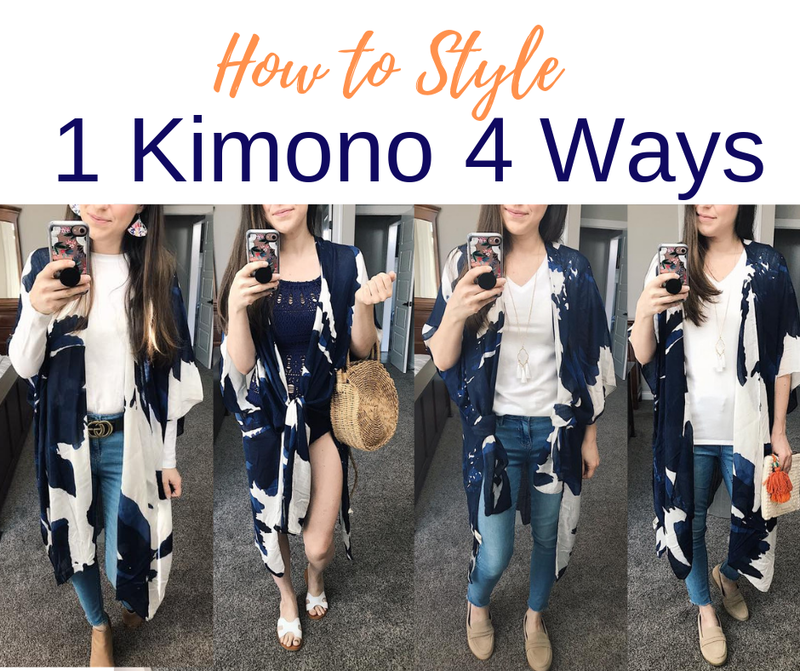 I'm showing you 4 of my favorite ways to wear kimonos, but the possibilities are endless! For cooler days, try them with a long sleeved tee or sweater underneath, and accent with a belt, statement earrings, and booties. When the weather is warmer, a short sleeved tee or tank looks great under a kimono. Dress it down with your favorite sandals or loafers, or dress it up with heels and faux leather leggings. I also like to play around with different ways to tie them and tuck them in to create different looks. You can also add a striped or colored top And perhaps my favorite way to wear a kimono is as a swimsuit coverup!